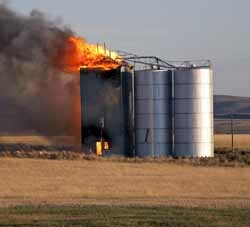 A grain elevator just off U.S. Highway 20 in Camas County near Fairfield went up in flames Tuesday night. Fairfield Fire Chief Monte Cangiamilla said the elevator had just been filled with extremely volatile fresh grain, and the blaze could have been sparked by anything from an electrical surge to a spark from an engine. The call came in at 7:30 p.m. and crews from the Fairfield Fire Department, Bureau of Land Management and the U.S. Forest Service worked until 2 a.m. on Wednesday to keep the fire from spreading toward nearby homes. The fire crept along an old railroad line for about a quarter mile before crews were able to contain it, Cangiamilla said. The elevator was completely destroyed in the fire, though two adjacent silos, on the right, survived. Cangiamilla said Thursday his department still had a spotter on the scene to ensure the sagebrush doesn’t reignite. Courtesy photo by George Martin Jr.
Why have a community orchestra?